I don’t watch a lot of television. It’s funny, because both of those statements are true. People talk about all their binge-watching and I can’t relate. I don’t watch The Good Doctor, the newest show I’ve heard everyone is watching. I don’t wait with giddy anticipation for the next “season” of The Walking Dead. I blogged about The Fall, a show that hooked me immediately, and lost me as soon as they caught him. (Really, what was the point after that? I enjoyed the cat and mouse, but when the cat is in the hospital, in custody, with enough evidence collected to fry him twelve times over, why aren’t the credits rolling?) I don’t watch Scandal, Designated Survivor, any of the NCIS or CSIs, and my reality TV is limited to American Idol. With cold weather and winter break soon upon us, you might be looking for some viewing recommendations. Number one on my list would be Stranger Things, but you’ve probably already binged on that. OKay, and there it is…I wasn’t sure what to blog about this morning and now I realize this whole Winter Viewing thing is a push for Me, Myself & I.
I guess I was a woman with a plan, lol. If you find yourself with some time (thirty minutes or so), on demand this show. 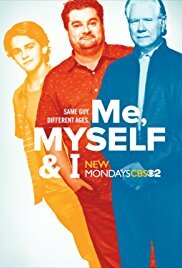 Me, Myself & I is a comedy that examines one man’s life over a 50-year span. It explores three distinct periods in his life– as a 14-year-old in 1991, a 40-year-old in present day and a 65-year-old in 2042. That’s Jack Dylan Grazer, one of the kids from IT, Bobby Moynihan (don’t judge, he’s good), and John Larroquette. If you need more convincing, it also has Sharon Lawrence, and Urkel. I hope you’ll put this show in your queue. I hope you’ll watch it. I hope you’ll enjoy it. And for the love of a unique premise among so much crap tv, I hope they pick it up for another season. Also, you should watch Kevin (Probably) Saves the World. It’s kind of nice to have a show that’s clever, silly, family-friendly, with no violence, body count, or sexual harassment. So, yeah, this one will (probably) get cancelled, too. What (new) shows do you make time for? Any recommendations? Do tell. This entry was posted in It's all about me and tagged IT, Kevin (probably) Saves the World, Mary Lamphere, Me Myself & I, Stranger Things, The Good Place, WHAT ARE YOU WATCHING?, Young Sheldon. Bookmark the permalink. HI Mary, really liked this. I haven’t really watched tv for years, but have started thinking about watching just for the writing part of it. I don’t have cable, but I do have Netflix. What would you recommend I watch there for good writing? I don’t intend to watch too much tv–I think lots of it is just a waste and I’d much rather read–but since I have a large-screen tv sitting in my living room maybe I should do more than dust it. Thanks for any suggestions you can give me. Hope you’re doing well, and have a happy Christmas.